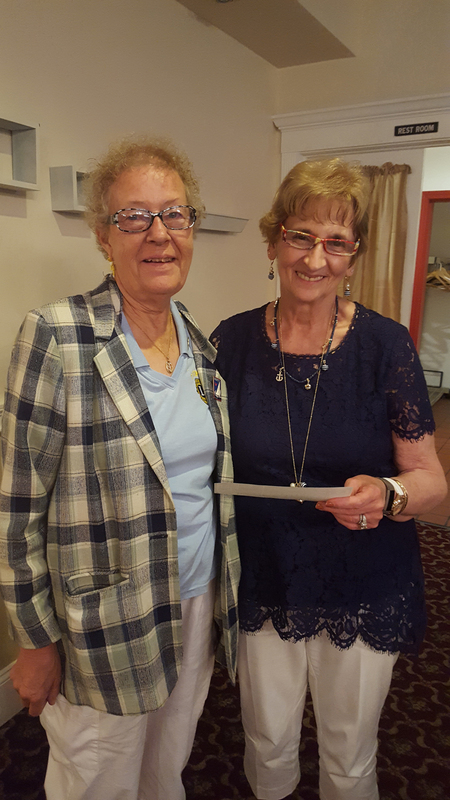 Vice President Elaine Bristol presents a check to Lion Geri Holewiak, who is also a board member for the Friends of Tiverton Library. The funds were raised at the "Annual Tiverton Library Book Fair'. 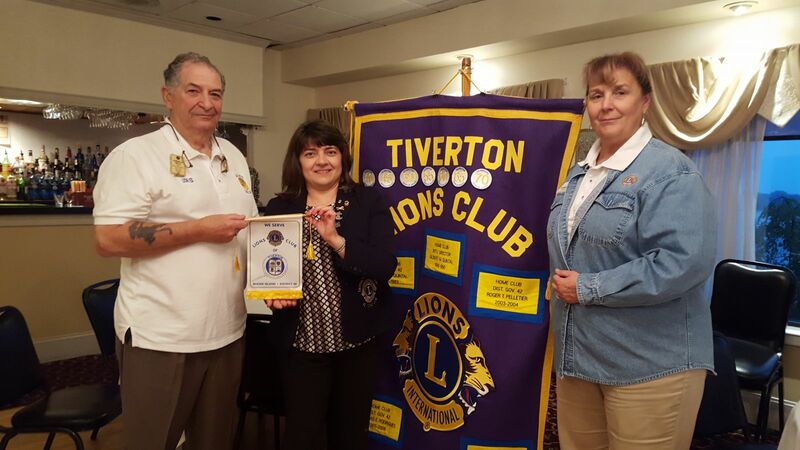 The Tiverton Lions set up a booth, cook and sell, hot dogs and hamburgers, with the proceeds going to the Library. This is just one of the many annual service projects our club does in the community. to Pres. David Vieira recognizing their 75 years of dedication to the town of Tiverton. President Dawn Cabral Quimby welcomes fellow Lions Jane and Ed Mello, visiting from Lake Sumter Lions Club, located in The Villages, FL. She presented them with our clubs Friendship Banner. It was a fun evening and great opportunity listening and learning about how Lions are so much alike yet do many different things. We all know that no matter where you are from as a Lions you are always family and we enjoying coming together. 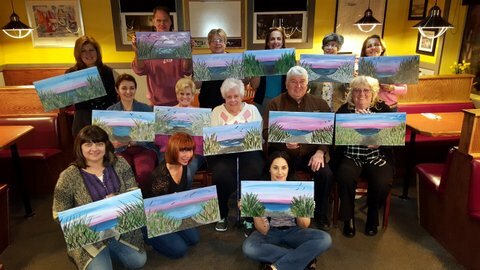 Rembrandt but we sure know how to have fun! 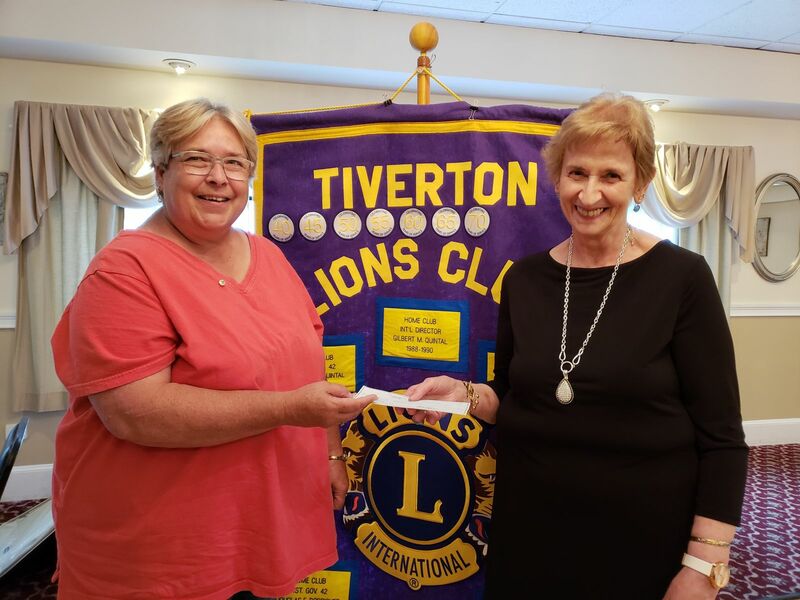 Lions Leslie Deschenes gives a check to Geri Holewiak from the Tiverton Library. The Tiverton Lions ran a food kitchen during the library's latest book fair. A portion of the money raised goes back to the library. 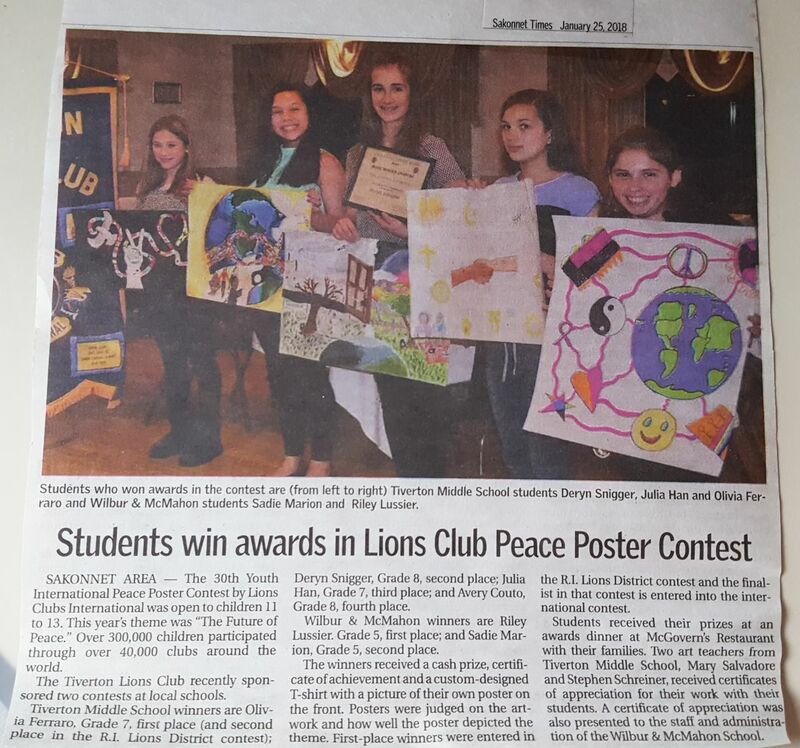 Each year Lions Clubs International sponsors the International Peace Poster Contest and more than 300,000 youth ages 11 to 13 from around the world participate. A theme is chosen and this year's theme was "Share Peace". Individual Lions Clubs sponsor their own contests and select their winners. The top winner of each contest is then entered into the RI District 42 or State Lions contest. The top poster is then entered into the International Peace Poster Contest. This years 1st place winner for Tiverton was Giavanna Materra, 8th Grade. Her poster was entered into the RI District 42 Lions Club Contest where she won 1st place. Her poster has now been entered into the International Contest with winners announced in March. 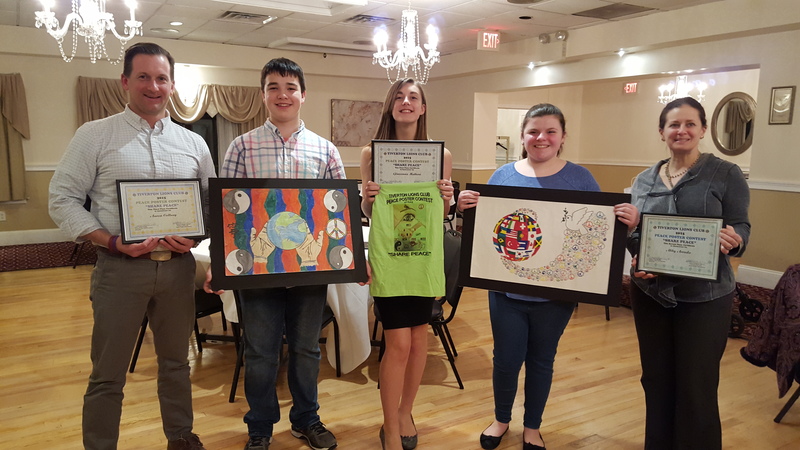 The 2nd place winner was Abby Arruda, 7th Grade and 3rd place winner was Aaron Colberg, 8th Grade. All students are from the Tiverton Middle School. Personalized t-shirts with a copy of their poster and certificates were presented to each of these winners along with a cash award. 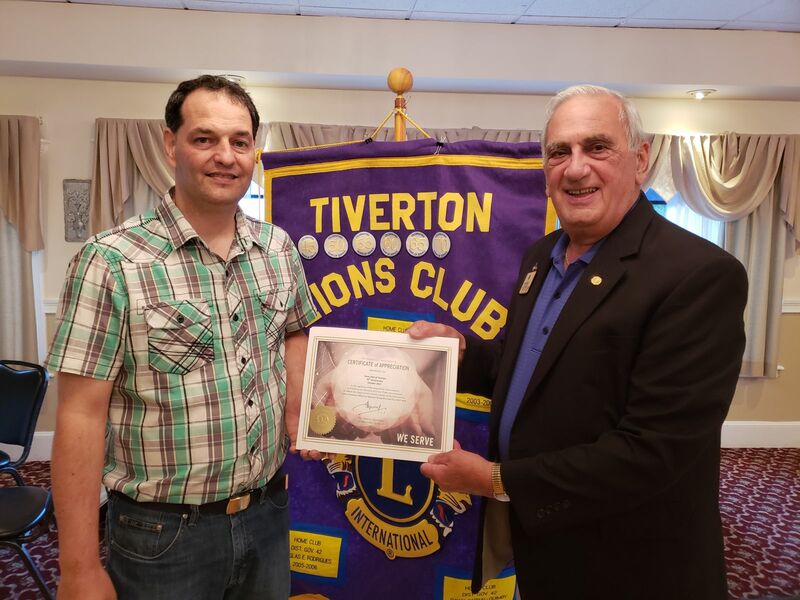 A certificate of appreciation was presented to Mr. Steven Schreiner and Ms Mary Salvadore, Art Teachers at the Tiverton Middle School who conducted the contest in their classes. These dedicated teachers motivate their students and help make this contest a success! We completed our Senoir Cookout again this year and it was another huge success. Thanks to all our volunteers who attended and helped make this a big hit. See our Photo Gallery for some pictures of the event.